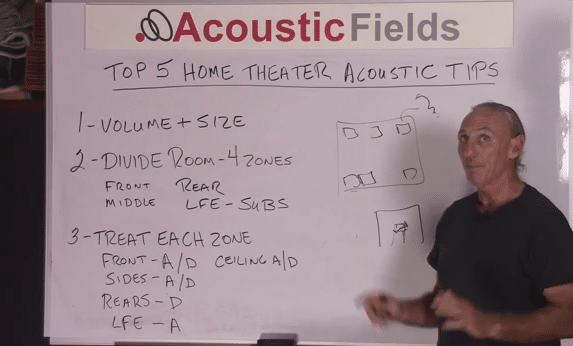 Today we’re going to look at the top five home theater acoustic tips that will help you with your home theater setup. We get a lot of questions about home theaters and home theaters are a lot different than two-channel systems. They have a lot more speakers and they have subwoofers producing more energy so we have different areas that we have to look at. Volume and size become more critical because you have more speakers and more energy. You have subwoofer low-frequency effect channels producing more energy, so all the problems that smaller room ratios and volumes have are just exasperated and increased with our home theater set up. So volume and size is critical. There are ratios that you can use to minimize the impact of low-frequency pressure issues and those are better done first before you start getting out the saws and the hammers. So draw the room out, get the right ratios and go from there. Your battle will be less uphill because it’s an uphill battle to begin with. This planning part makes the slope of the incline a little bit less. This is critical because you need to think about a home theater this way. We have a front, middle, rear and then a low-frequency effect area that needs to be addressed. So we really have four zones within the home theater. The front channels have the left, center and right. What are their sound field requirements? Focus, separation and definition. So proper management of sidewall reflections, distances to speaker and listening position, center channel in relation with left and right are all important. When a plane flies across the screen left to right, does the sound follow left to right? So all of these signatures, these time-delayed reflections from the sidewall and everything have to be managed in a way that’s pretty similar to two-channel. So the front end takes on kind of a two-channel acoustical treatment approach. The middle section of the room where we’re seated, where we have the side channels, we don’t necessarily want focus. In fact we don’t want to know where the side channel energy is radiating from. We just want it there as an ambient level around us but we don’t want any distinct separation sound stage, focus, central image and things like that. The image is shifting all over the place and that’s what we want. We also don’t want to hear where the side energy from our side channel speakers is coming from. A speaker there needs to be a void or a null area between ourselves and the speaker. So therefore, we have a new dimension now to the sound field that we had for the front of the room. The third area is the rear of the theater. Same as the side channels we want ambient lower pressure level areas in the back, non localization of sound, really not that much definition and separation, definitely not a focused sound stage with the central image. So the rears and the middles have kind of a similar sound field distribution that they’re trying to achieve, that the engineer wants you to hear that’s in the mix. So the acoustical treatment that goes with those areas to create those sound fields is critical and you have to choose it correctly. With low-frequency pressure from the subs, low-frequency effect channels, we can have a 7.1, 7.2, 7.3, 7.4 system. So we can have one to four subs in our room and, on average, I’ve seen all ranges. I saw a home theater the other day with four 18’s. Lots of energy. With lots of energy comes the need for proper management. In the room if you have four subs, where are they going to go? You’re going to put them in the corners? Okay. You’re going to increase all the modal activity with more pressure from the corners of the room? What is the modal pressure? What is the modal energy in the corner? Whatever it is, you’re going to increase it. It’s usually unwanted; it’s usually where all room modes end, kind of get together and party. You want that energy in your room? Probably not, so what we have to do is find their position and sometimes they’re mid wall, sometimes they’re not mid wall they’re more towards the front third of the wall and maybe they’re elevated off the floor, that’s another possibility. We have this dimension also to work with. So positioning the subs in the room to achieve a nice even frequency response at those low frequencies is very critical. We have to treat each zone with the acoustical treatment that we have available to us. What treatment options are there? For the front wall we have absorption and diffusion. For the rears and sides, we have for the sides absorption and diffusion and for the rears we have diffusion. For the low-frequency effect channel with low frequency energy we’ve got to use absorption, there’s just no way around it, but it has to be pressure activated absorption. Which means no foams, no building insulation for this is a pressure activated device creating pressure within the room so the acoustical treatment we have to use is pressure related. Our home theater rooms have lots of energy in it. We just discussed that some rooms can have up to four subwoofers, which produce a lot of energy. As long as that energy stays in the room, everybody’s good but, unfortunately, it’s not going to. It’s going to go out into the other rooms that are adjacent to the structure, adjacent to the home theater room itself, and usually they’re in homes. So how much energy are the people in the rest of the house going to be able to tolerate? How much and at what frequencies are they going to be tolerating? And there are a lot of frequencies people simply can’t tolerate. There are some people that find low frequency energy really bothers them because, and we’ve done videos on this, we really don’t hear low frequency energy, it’s more of a feeling because of our skeletal system vibrating and our skull vibrating. So that freaks a lot of people out and you have to be really concerned about that with the home theater room. Sometimes those that are in basements don’t have the resources to really isolate the floor, which is the ceiling in the home theater room but the floor for the people upstairs, and there’s just times during the day you can’t use your home theater room because people are in that room. I mean it can really be that bad that you have to be very concerned about all the energy in the room and provide the proper isolation and barrier technology not only to keep sound in the room but to keep sound from leaving the room and from keeping extraneous sounds from outside sources outside the room coming in. So it’s got a one-way gate barrier technology is. It’s frequency dependent, you know with home theater room everything’s low-frequency so our barrier technology has to be less than 125 cycles, breaks down into less than 125, greater than 125 in terms of amount of materials, construction methodology, installation requirements the costs triples. So big, big factors here to consider. When you have a home theater with all this energy in it. I see this constantly, too many seats not enough usage. Having too many seats and filling the space with seats that you never use really has a detrimental impact on your acoustics. 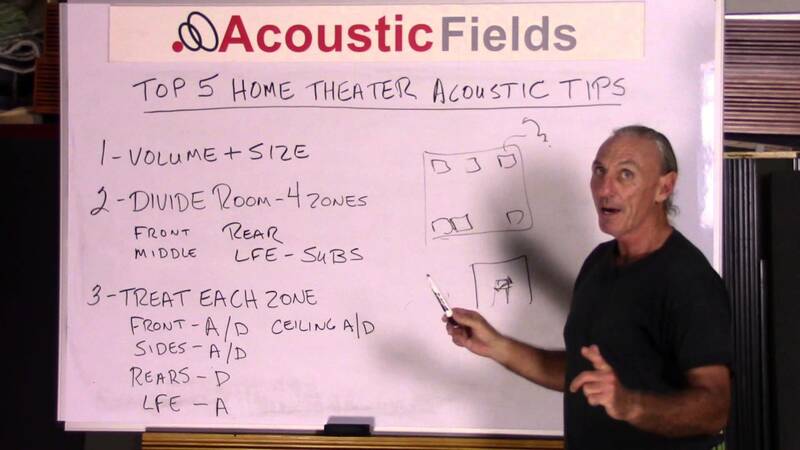 Open space for the rear channels is wanted and the acoustical treatment that you put on the rear channels, like we discussed in the first few home theater acoustic tips, is critical to creating that ambient, non-localized level that’s going to be behind you. So you’re going to actually feel the presence of sounds behind you and not in front of you. So way different acoustical treatment requirements. If you have a bunch of seats back there that you don’t use, you’re messing up with that sound field. So really give it a hard look. I never see a home theater with just the right amount of seats. I always see home theaters with too many seats and I know that if they would take out one or two rows that they never use, they would have much better sound. So really think about the number of seats you’re going to use and work from an ideal situation, which is one seat, and work on back. Now I know that’s not going to be feasible but that definitely is ideal from an acoustic stand point, maybe two depending on the room width. If you would like to learn more about room acoustics please sign up for my free videos and ebook by joining the mailing list here. I send room tuning tips and things for you to test in your room every Wednesday. They are easy to follow and will really help you enjoy more of your music. Alternatively feel free to contact me directly at: 520 – 392 – 9486 MST or info@acousticfields.com. 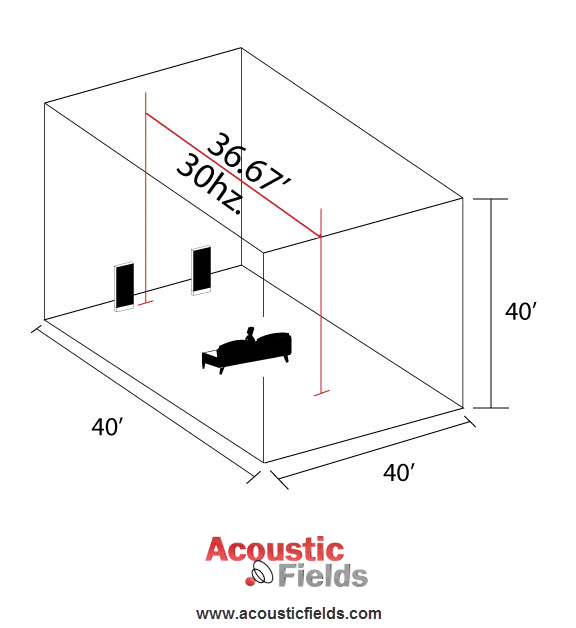 You can see more of my research and development story and why I started Acoustic Fields at: http://www.acousticfields.com/who-we-are/ or complete the free room acoustic analysis form here so I can take a look at the dimensions you are working with and I’ll be happy to offer an initial free consultation. It’s good to know that volume and size of room are important when deciding what kind of speakers will be needed for my home theater. I feel like having enough sound is a really important aspect to having a good theater room. I don’t know much about acoustics though, so I’ll look for a good installation expert who can adequately determine the volume of my room and provide the right amount of sound.